The first time I had this pie was at the first Pie Party Potluck LIVE! My friend George brought it, and I took one taste and I was hooked. It’s like an inverted lemon meringue pie where the crust is meringue. Don’t call it gluten-free because it’s so beyond that… but know that there’s no gluten in it and no one will wonder where it went. Grease a 9” pie pan with cooking spray; set aside. Sift together sugar and cream of tartar; set aside. In a stand mixer or large mixing bowl beat the egg whites with the vanilla at a slow speed to incorporate them. When the whites are foamy, add the cream of tartar and sugar mixture a little at a time. 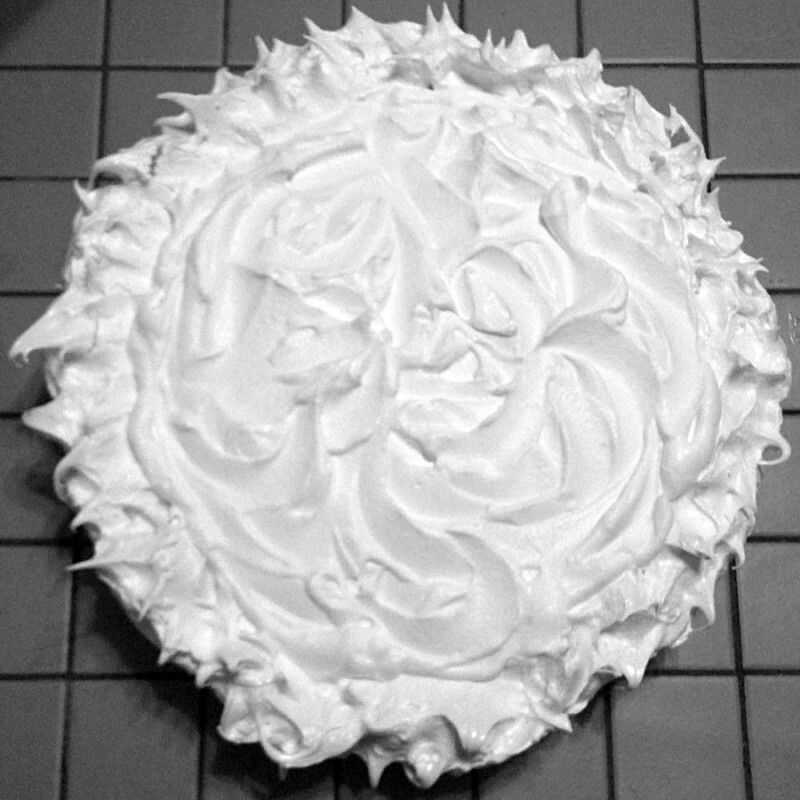 When the meringue begins to form soft peaks, increase to a moderate beating speed. Beat for about 5 minutes, until the meringue is thick and glossy and peaks when the beaters are lifted. Carefully spread the meringue in the pan to form the crust. You can pipe the meringue around the edges of the pan to make it “fancy.” Remember that meringue always shrinks a little so build up the sides to compensate. Tease the meringue edge with a butter knife to create peaks. Bake meringue for one hour. Cool completely. Put egg, egg yolks, sugar, lemon juice and rind in a double boiler, over simmering water. Cook until thick and creamy (about 10-15 minutes), stirring frequently, more frequently as it thickens until it’s thick enough to coat a spoon. Cool slightly, cover with a piece of plastic wrap to prevent skinning and cool completely. Mix gelatin and cold water until the gelatin absorbs the water. Heat to melt gelatin to melt it (in a microwave for 3 minutes, stirring every minute or in a small sauce pan on the stove on low flame, stirring constantly, until melted). Cool for about 10 minutes. Gelatin must be cool before you beat it into the cream. In a chilled bowl with chilled beaters, whip cream, sugar and vanilla until mixture just starts to hold a shape (you can just begin to see marks in the cream when you stop beating and lift the beaters), then beat in gelatin in a steady stream until stiff peaks form. Be careful not to over beat. Fold half the whipped cream and cooled lemon curd together and pile in the pie pan. Pipe remaining whipped cream on top or pile it on, mounding it towards the center. Serve immediately or store in the refrigerator. If you are feeling very zealous you could candy some lemon slices to garnish it, but I just served it as is and they wept with joy!